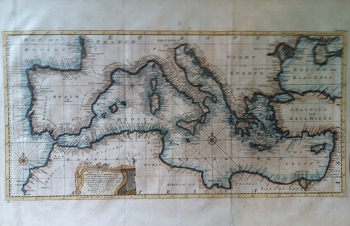 An Accurate Chart of the Mediterranean and Adriatic Seas . . .
with the Archipelago & part of the Black Sea Exhibiting all the ISLANDS in those Seas as also the Adjacent Countries on the Continents of Europe, Africa & Asia . . This is a copper engraving by Bowen dated 1748 with modern hand coloring. Note the lovely cartouche and compass rose. The map is from the Complet Collection of Voyages and Travels by John Harris, vol. II and measures 15 1/2 x 24 inches. Documentation on reverse.